This film is a movie where the bad guys are super bad (I felt like slapping them), the good guys are pretty real (not exactly the samaritan as they did many things out of personal interests – pretty human) and the police were… smart but useless. Rather than a film that makes you anticipate, you would feel as if you are taking the unknown journey with them, and just hope for the best. While Joseph Chang did a pretty irritable job (I mean realistic) portraying Blackie, a Taiwanese gangster, there were parts of the film which didn’t really make sense. He wanted to return to Taiwan after completing the final job, but was stopped by the head of the gang. When the head dies, he went berserk trying to hunt down the two protagonists (Louis Koo and Shawn Yue) determined to take revenge. Sounds legit? That was what I thought would happen, but it didn’t. His attention shifted to the woman (Tong Liya) despite the client’s request to cancel the killings and leave the country. I still didn’t get it. That little glitch aside, it was enjoyable watching T-man (Louis Koo) work his way out of the whole complication and solve the dilemma between his principles as an ex-cop and his wayward “brother”, Shawn Yue. I had assumed that the two veteran actors taking up similar police-thief roles for so many times, it would be easy to link them to some familiar characters they acted in the past. But nope, the sense of brotherhood, their contrasting characters was evident and unique throughout. Although there weren’t any notable action scenes, the action sequences still manage to put the audience at the edge of their seats. Two regular common guys struggling against the triads from both Hong Kong and Taiwan plus the cops who didn’t see to believe them. The use of real knives made the whole sequence realistic not just for the audience but also for the cast! Fans of the classic Hong Kong thrillers will like this film, and overlook the few problematic CGI because of the momentum. Besides the little irrational behaviour from Blackie (Joseph Chang), what frustrated me the most was the play on “damsel in distress”. I was literarily wanting to slap this trouble maker. In this film, I finally understood why there’s the saying, “women are nothing but trouble (女人是祸水)”! Thank god Ringo Lam did not try to add in any romance scene for them, or I might just walk out of the cinema! For Hong Kong film fans who might not be familiar with her, Tong Liya starred in Palace (宫, 2011) and Beauty World (唐宫美人天下, 2011) and all I can say, her role is pretty suppressed here. With all the familiar elements, it was not difficult to get excited and thrilled by the scuffles and knife-wielding, but somehow, something seems missing – what and where I can’t put my finger on. I guess the missing puzzle to the film about corruption, greed and brotherhood was T-Man’s (Louis Koo) words: “forget self” (忘我) at the end of the film, if only I understand what he was trying to imply, maybe this Wild City will be a little more meaningful. Wild City marks Director Ringo Lam big return to sliver screen after an eight-year hiatus. His last film was Triangle (2007). This film is the final installment of the “City” Trilogy, with the first being ‘City on Fire’ (1987) and ‘Full Alert’ (1997) Lam insisted that the actors perform their own stunt work in the film to maintain realism. Real knives were used in the fights after the actors practised the action sequences a few times. Check out Wild City (迷城)Facebook Page and Bravos Pictures Official Website. 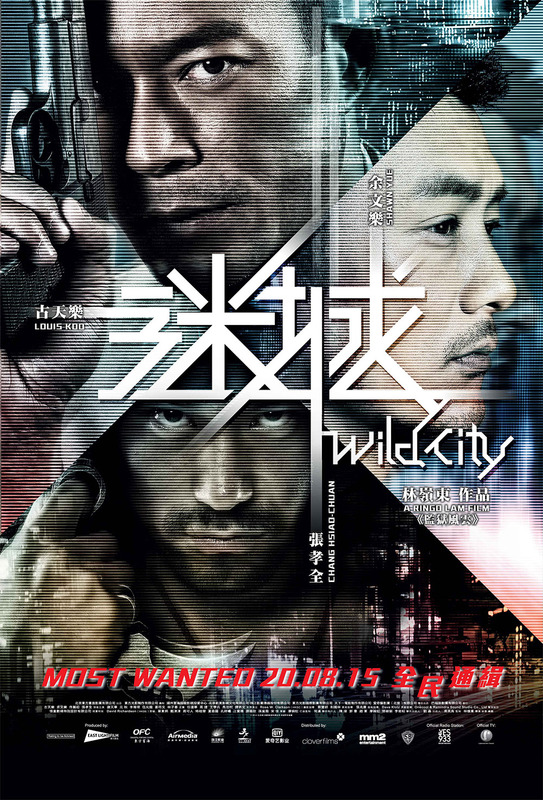 Wild City (迷城) is out in cinemas on 20 August 2015. I love an action film with a bit of a story behind the plot. I haven’t heard of this in the UK but it would be one i would watch for sure. My favourite actor Louis Koo, I am watching this movie this weekend. Hopefully its up to my expectation. Seems a good one but lately, I am staying away from watching action movies. The story looks a bit similar. I have seen a movie like this one before but can’t figure out the name at the moment. This looks like an action packed movie. It would surely keep you glued for weeks. looks like a good old fashioned Hong Kong action movie, like those I grew up with in the 90s. Decent cast too. But not my cup of tea. i am not a fan of gangster movies. I think i’ll pass watching this one. I just can’t bear the fact that violence is getting worse and worse in our society nowadays. Oh wow I have not heard of this movie but it looks and sounds really interesting! My hubby loves these type of films! chinese action movies! not a big fan of any of the actors, but i might catch this if i have the time. didn’t hear about this movie before. just yesterday I was browsing popcorn app for movies to catch and was thinking to myself, is wild city something similar to sin city kind of movie. hahaha! oh, and i went for hitman instead. I will watch this one. I like the lead actors, plus I am intrigued with how the director will put together everything in Wild City. An 8-year hiatus is a pretty long time. I hop Ringo Lam hasn’t lost his groove. Wild City should be exciting to watch. Not really a fan of action movies, but my dad would probably like this one. He always asks us to download action movies from the net. This is the first time I’ve heard of this movie but my sister loves watching films from HK, China, Taiwan, South Korea, Japan, so I will recommend this one to her. I have not heard of this movie. The way you describe it seems a bit interesting and I will definitely give it a try. I give all movies a fair chance. What an action packed movie. I hope this gets shown here in Thailand. Never heard of this movie although the lead actress seems kinda familiar, I think she starred with Gerry Yan in a drama. Who knew I would recognize her here, it’s making me want to see the film. Plus I’m a sucker for action flicks. It looks like a lot of effort was put in this movie. Good job to everyone who helped put this together.